With the new Xbox360 update...the appearance is very Nintendo Wii like. On the Wii you have to create a Mii to play games. A Mii (pronounced Me) is a character you design. Mine looks like the old me (with dreadlocks). Now on the new 360 you have to do the same thing! The menus and the feel of the menus is also Wii like. Odd seeing Microsoft copy Nintendo. 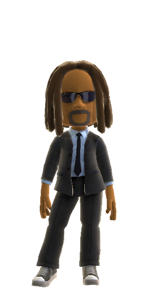 Here is my Xbox Avatar. Yes its cooler than I look currently....but the hair reminds me of my college self. I tried to new Netflix application this morning on the 360. Everything worked perfectly. All you have to do is go online to your Netflix account and add videos to your "watch instantly" que the same way you would for a normal DVD que. I then launched the Netflix program on the 360 and all the movies were there for me to scroll through. I selected a movie and it began playing within seconds. The quality was just as good as a DVD. There are a few...and I mean few High Definition movies to select from as well. I bought a 12 month (with a free month...so 13 month) XBox Live Gold card from Amazon for $38.99. This is way cheaper than the normal $50. We will see how it goes.